We propose a new photocatalytic interface prepared by High-Power Impulse Magnetron Sputtering (HiPIMS) and investigated for the degradation of Reactive Green 12 (RG12) as target contaminant under visible light LEDs illumination. The CuxO/TiO2 nanoparticulate photocatalyst was sequentially sputtered on polyester (PES). The photocatalyst formulation was optimized by investigating the effect of different parameters such as: the sputtering time of CuxO, the applied current and the deposition mode (Direct Current Magnetron Sputtering, DCMS or HiPIMS). The results show that the fastest RG12 degradation was obtained on CuxO/TiO2 sample prepared at 40 A in HIPIMS mode under low intensity LEDs irradiation. The better self-cleaning efficiency of 53.4% within 360 min was found with 4 mg/L of RG12 initial concentration and 0.05 % Cuwt/PESwt as determined by X-ray Fluorescence. All the prepared samples contain a TiO2 under layer with 0.02% Tiwt/PESwt. By transmission electron microscopy (TEM), both layers were seen uniformly distributed on the PES fibers. The effect of the surface-area to volume (dye volume) ratio (SA/V) on the photocatalytic self-cleaning efficiency was also investigated for the discoloration of 4 mg/L RG12. The CuxO/TiO2 photocatalyst was found to have a good reusability and stability up to 21 cycles. Ions release were quantified by mean of inductively coupled plasma mass spectrometry (ICP-MS) showing low Cu-ions release. The textile industry is one of the largest consumers of water on our planet, and the second most polluting industry after the oil and gas industry . Textile effluent containing synthetic dyes have toxic and carcinogenic compounds, which are stable and non-biodegradable due to the high molecular weight, the presence of azo bonds and amide groups in the molecular structure. Many of chemical and physical treatment process have shown insufficient results toward the degradation of theses pollutants. Recently, heterogeneous photocatalysis is one of advanced oxidation processes that increasingly interests researchers. Photocatalysis was seen to transform/mineralize these synthetic dyes to lesser harmful by-products before their discharging into the environment. In the last decade, numerous works have been mostly focused on the designing and the development of new photocatalytic materials . In this direction, different methods and preparations were investigated . Sol-gel , hydrothermal , combined sol-gel/hydrothermal , chemical vapor deposition (CVD) , liquid phase deposition (LPD) methods  among many others were reported in the literature. In the aim of understanding the relationship between physico-chemical proprieties of photocatalyst and photocatalytic performances, various strategies have been adopted. Many studies investigated the effect of: (1) semiconductor type such as TiO2, ZnO and SnO2… ; (2) the number (mono-, bi- or tri-doping) and the ratio of doping agents (N, P, Fe, Ag…) ; (3) the support type such as polyester, cellulose, polypropylene or polystyrene  and (4) the substrate functional groups before the catalyst deposition . It has been widely reported that band gap energy, surface area, particles size and chemical stability are the most important parameters controlling the reactivity of a photocatalytic material . TiO2 was reported to be the most suitable photocatalyst because of its high stability, low toxicity, low cost, chemical inertness, wide band gaps and resistance to photo-corrosion . Conventional direct current magnetron sputtering (DCMS) and high-power impulse magnetron sputtering (HiPIMS) have been used during the last decade to prepare photoactive thin films . These films were reported to exhibit redox catalysis leading to bacterial inactivation , organic dyes degradation , antifungal , corrosion resistance  and self-cleaning . Sequentially sputtered TiO2/Cu showed bacterial inactivation in the minute range . Co-sputtered TiO2-CuxO using HiPIMS was reported to lead to compact photoactive films showing reduced ions release . The main goals of the present study are: i) to explore the HiPIMS deposition of CuxO on TiO2 under-layer, ii) to optimize the deposition parameters leading to stable thin film materials showing fast degradation of a toxic textile dye (Reactive Green 12) as target hazardous compound, and iii) the use of visible light LEDs system as efficient and economic light source for RG12 self-cleaning. The photocatalytic activity of the synthesized photocatalyst was evaluated by following the degradation of 15 mL of the RG12 dye solution in petri dish as reactor under magnetic stirring (see Figure 1). The reaction system included an Ultraviolet Light-Emitting Diodes system (visible light LEDs) as an irradiation source (λ=420 nm) with measured intensity of 1 mW/cm2. The initial RG12 solution was stirred in the dark for 30 min to reach adsorption–desorption equilibrium before the LEDs irradiation is ON. The concentration of dye solution samples (V=3 mL) was analyzed using a UV–Vis spectrophotometer at regular time intervals. The protective grid is made of stainless steel and is used to protect the catalyst from the possible mechanical damage caused by the stirrer. Figure 1: Photocatalytic apparatus for RG12 degradation. Where A0 and At are the initial intensity of absorbance peak at λmax (λmax=615 nm) and the intensity of absorbance peak at time t in UV-Vis spectra of RG12, respectively. The coated fabrics were also tested for stability by testing their recycling performance. The ions release from the fabrics were quantified using inductively coupled plasma mass spectrometry (ICP-MS). The ICP-MS resolution is of 1.2x105 cps/ppb with a detection limit of 0.2 ng/L. The washing solution from the samples were digested with nitric acid 69% (1:1 HNO3 + H2O) to remove the organics and to guarantee that there were no remaining ions adhered to the reactor wall. Figure 2 shows the TEM imaging of the sputtered layers (HiPIMS at 40 A) on PES. The TiO2 under was sputtered to reduce the porosity of the PES leading to the continuous distribution of the CuxO upper layer . Figure 2. TEM imaging of CuxO/TiO2 deposited by HiPIMS at 40 A. The charge transfer between the TiO2 and the CuxO at the surface and the organic pollutant depends on the diffusion length of the photo-generated charges at the interface of the film under light irradiation. The charge transfer/diffusion is also a function of the TiO2 and of the Cu-particles size and shape as previously reported . In the aim to evaluate the stability and the reusability of the synthesized material supported on PES used in this study, successive photocatalytic cycles were applied for the degradation of RG12 (4 mg/L in each experiment) with same catalyst. As it can be seen in Figure 10, the photocatalyst has a good stability under LEDs illumination approved by the slight decrease in discoloration efficiency (about 7%) after 21 runs. The released Cu and Ti-ions from the fabrics after 1, 5, 10 and 21 washing cycles were investigated. 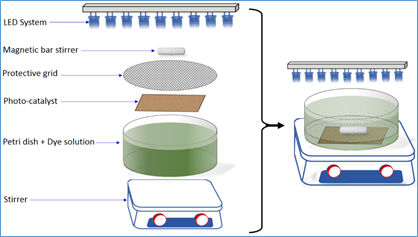 The Ti-ions were found at very low quantities during the first 5 cycles and then reduced drastically to almost zero ppb at the end of the recycling experiment. The Cu-ions release of 12-17 ppb (during the first cycles) slow down at the end of the recycling (after the 10th cycle) to stabilize at about 2-3 ppb/cycle. These results are slightly similar to previous reports using HiPIMS deposition of CuxO or TiO2/Cu deposited on polyester for photocatalytic applications . The cumulative ions release is still far below the threshold fixed by regulatory bodies for Cu- and/or Ti-ions. CuxO thin films deposited using HiPIMS on polyester under different sputtering energies were successfully synthesized. The sputtering mode and the applied current intensity were optimized. The photocatalytic performance of the photocatalyst was evaluated for the degradation of RG12 under visible light LEDs irradiation with different dye initial concentration and surface-are to volume ratios. The recycling of the catalyst showed a high stability of the catalyst up to 21 RG12 discoloration cycles. ICP-MS showed stable ions release after the 5th cycle for both ions. This allows potential industrial applications of the reported HiPIMS coatings in the future. B Neppolian; H C Choi; S Sakthivel; B Arabindoo; V Murugesan; Solar light induced and TiO2 assisted degradation of textile dye reactive blue 4.. Chemosphere 2002, 46, 1173-1181, https://doi.org/10.1016/S0045-6535(01)00284-3. Joanna Grzechulska; Antoni Waldemar Morawski; Photocatalytic decomposition of azo-dye acid black 1 in water over modified titanium dioxide. Applied Catalysis B: Environmental 2002, 36, 45-51, 10.1016/s0926-3373(01)00275-2. N.P. Radhika; Rosilda Selvin; Rita Kakkar; Ahmad Umar; Recent advances in nano-photocatalysts for organic synthesis. Arabian Journal of Chemistry 2016, 1, 1, 10.1016/j.arabjc.2016.07.007. Suzana Šegota; Lidija Ćurković; Davor Ljubas; Vesna Svetličić; Ivona Fiamengo Houra; Nenad Tomašić; Synthesis, characterization and photocatalytic properties of sol–gel TiO2 films. Ceramics International 2011, 37, 1153-1160, 10.1016/j.ceramint.2010.10.034. M. Zulfiqar; S. Chowdhury; A.A. Omar; Hydrothermal synthesis of multiwalled TiO2 nanotubes and its photocatalytic activities for Orange II removal. Separation Science and Technology 2018, 53, 1412-1422, 10.1080/01496395.2018.1444050. Hsu-Hui Cheng; Shiao-Shing Chen; Sih-Yin Yang; Hui-Ming Liu; Kuang-Shan Lin; Sol-Gel Hydrothermal Synthesis and Visible Light Photocatalytic Degradation Performance of Fe/N Codoped TiO2 Catalysts. Materials 2018, 11, 939, 10.3390/ma11060939. Junko Misaka; Masato Takeuchi; Maskazu Anpo; Hiromi Yamashita; Masaru Harada; Keita Ikeue; Degradation of propanol diluted in water under visible light irradiation using metal ion-implanted titanium dioxide photocatalysts. Journal of Photochemistry and Photobiology A: Chemistry 2002, 148, 257-261, 10.1016/s1010-6030(02)00051-5. Shinsuke Nagamine; Akiko Sugioka; Hiroyuki Iwamoto; Yasuhiro Konishi; Formation of TiO2 hollow microparticles by spraying water droplets into an organic solution of titanium tetraisopropoxide (TTIP) — Effects of TTIP concentration and TTIP-protecting additives. Powder Technology 2008, 186, 168-175, 10.1016/j.powtec.2007.11.027. M. Z. B. Mukhlish, F. Najnin, M. M. Rahman, M. J. Uddin; Photo-catalytic Degradation of Organic Dyes with Different Chromophores by Synthesized Nanosize TiO2 Particles. JOURNAL OF SCIENTIFIC RESEARCH 2013, 5, 301-314, 10.3329/jsr.v5i1.11641. Dnyaneshwar R. Shinde; Popat S. Tambade; Manohar G. Chaskar; Kisan M. Gadave; Photocatalytic degradation of dyes in water by analytical reagent grades ZnO, TiO2 and SnO2: a comparative study. Drinking Water Engineering and Science 2017, 10, 109-117, 10.5194/dwes-10-109-2017. Olga Sacco; Marco Stoller; Vincenzo Vaiano; Paolo Ciambelli; Angelo Chianese; Diana Sannino; Photocatalytic Degradation of Organic Dyes under Visible Light on N-Doped Photocatalysts. International Journal of Photoenergy 2012, 2012, 1-8, 10.1155/2012/626759. Yamina Ghozlane Habba; Martine Capochichi-Gnambodoe; Yamin Leprince-Wang; Enhanced Photocatalytic Activity of Iron-Doped ZnO Nanowires for Water Purification. Applied Sciences 2017, 7, 1185, 10.3390/app7111185. Chiara Gionco; Debora Fabbri; Paola Calza; Maria Cristina Paganini; Synthesis, Characterization, and Photocatalytic Tests of N-Doped Zinc Oxide: A New Interesting Photocatalyst. Journal of Nanomaterials 2016, 2016, 1-7, 10.1155/2016/4129864. Asma Mayoufi; Moahamed Faouzi Nsib; Olfa Ahmed; Ammar Houas; Synthesis, characterization and photocatalytic performance of W, N, S-tri-doped TiO2 under visible light irradiation. Comptes Rendus Chimie 2015, 18, 875-882, 10.1016/j.crci.2015.02.009. O. Baghriche; Sami Rtimi; C. Pulgarin; J. Kiwi; Polystyrene CuO/Cu 2 O uniform films inducing MB-degradation under sunlight. Catalysis Today 2017, 284, 77-83, 10.1016/j.cattod.2016.10.018. Hichem Zeghioud; Aymen Amine Assadi; Nabila Khellaf; Hayet Djelal; Abdeltif Amrane; Sami Rtimi; Reactive species monitoring and their contribution for removal of textile effluent with photocatalysis under UV and visible lights: Dynamics and mechanism. Journal of Photochemistry and Photobiology A: Chemistry 2018, 365, 94-102, 10.1016/j.jphotochem.2018.07.031. H. Aliah, M. Prasetya Aji, Masturi, E. Sustini, M. Budiman, M. Abdullah; TiO2 Nanoparticles-Coated Polypropylene Copolymer as Photocatalyst on Methylene Blue Photodegradation under Solar Exposure. American Journal of Environmental Sciences 2012, 3, 280-290, 10.3844/ajessp.2012.280.290. Hichem Zeghioud; Nabila Khellaf; Abdeltif Amrane; Hayet Djelal; Walid Elfalleh; Aymen Amine Assadi; Sami Rtimi; Photocatalytic performance of TiO 2 impregnated polyester for the degradation of Reactive Green 12: Implications of the surface pretreatment and the microstructure. Journal of Photochemistry and Photobiology A: Chemistry 2017, 346, 493-501, 10.1016/j.jphotochem.2017.07.005. Sami Rtimi; Indoor Light Enhanced Photocatalytic Ultra-Thin Films on Flexible Non-Heat Resistant Substrates Reducing Bacterial Infection Risks. Catalysts 2017, 7, 57, 10.3390/catal7020057. Hichem Zeghioud; Nabila Khellaf; Hayet Djelal; Abdeltif Amrane; Mohammed Bouhelassa; Photocatalytic Reactors Dedicated to the Degradation of Hazardous Organic Pollutants: Kinetics, Mechanistic Aspects and Design-A Review. Chemical Engineering Communications 2016, 203, 1415-1431, 10.1080/00986445.2016.1202243. Michael R. Hoffmann; Scot T. Martin; Wonyong. Choi; Detlef W. Bahnemann; Environmental Applications of Semiconductor Photocatalysis. Chemical Reviews 1995, 95, 69-96, 10.1021/cr00033a004. Md Rokon Ud Dowla Biswas; Asghar Ali; Kwang Youn Cho; Won-Chun Oh; Biswas Md Rokon Ud Dowla; Novel synthesis of WSe2-Graphene-TiO2 ternary nanocomposite via ultrasonic technics for high photocatalytic reduction of CO2 into CH3OH. Ultrasonics Sonochemistry 2018, 42, 738-746, 10.1016/j.ultsonch.2017.12.030. Donald A. Tryk; Tata N. Rao; Akira Fujishima; Titanium dioxide photocatalysis. Journal of Photochemistry and Photobiology C: Photochemistry Reviews 2000, 1, 1-21, 10.1016/S1389-5567(00)00002-2. Sami Rtimi; Dionysios D. Dionysiou; Suresh C. Pillai; John Kiwi; Advances in catalytic/photocatalytic bacterial inactivation by nano Ag and Cu coated surfaces and medical devices. Applied Catalysis B: Environmental 2019, 240, 291-318, 10.1016/j.apcatb.2018.07.025. Sami Rtimi; C. Pulgarin; R. Sanjines; J. Kiwi; Kinetics and mechanism for transparent polyethylene-TiO 2 films mediated self-cleaning leading to MB dye discoloration under sunlight irradiation. Applied Catalysis B: Environmental 2015, 162, 236-244, 10.1016/j.apcatb.2014.05.039. Xue-Qiang Tan; Jian-Yong Liu; Jia-Rong Niu; Jia-Yin Liu; Jun-Ying Tian; Recent Progress in Magnetron Sputtering Technology Used on Fabrics. Materials 2018, 11, 1953, 10.3390/ma11101953. Ceyda Senem Uyguner Demirel; Nazmiye Cemre Birben; Miray Bekbolet; Ceyda S. Uyguner-Demirel; Cemre N. Birben; A comprehensive review on the use of second generation TiO2 photocatalysts: Microorganism inactivation. Chemosphere 2018, 211, 420-448, 10.1016/j.chemosphere.2018.07.121. Myriam K.S. 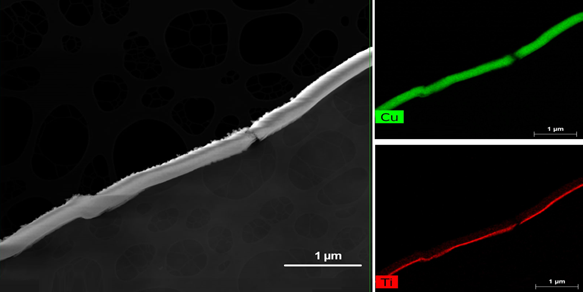 Ballo; Sami Rtimi; John Kiwi; César Pulgarin; José M. Entenza; Alain Bizzini; Fungicidal activity of copper-sputtered flexible surfaces under dark and actinic light against azole-resistant Candida albicans and Candida glabrata. Journal of Photochemistry and Photobiology B: Biology 2017, 174, 229-234, 10.1016/j.jphotobiol.2017.07.030. Haibo Wu; Xiangyu Zhang; Zhenhua Geng; Yan Yin; Ruiqiang Hang; Xiaobo Huang; Xiaohong Yao; Bin Tang; Preparation, antibacterial effects and corrosion resistant of porous Cu–TiO2 coatings. Applied Surface Science 2014, 308, 43-49, 10.1016/j.apsusc.2014.04.081. Weerachai Sangchay; Lek Sikong; Kalayanee Kooptarnond; Photocatalytic and Self-Cleaning Properties of TiO2-Cu Thin Films on Glass Substrate. Applied Mechanics and Materials 2012, 152, 409-413, 10.4028/www.scientific.net/amm.152-154.409. Sami Rtimi; Oualid Baghriche; César Pulgarin; Jean-Claude Lavanchy; John Kiwi; Growth of TiO2/Cu films by HiPIMS for accelerated bacterial loss of viability. Surface and Coatings Technology 2013, 232, 804-813, 10.1016/j.surfcoat.2013.06.102. Mousa Sadeghi-Kiakhani; Sara Khamseh; Akbar Rafie; Seyed Mohsen Fatemi Tekieh; Payam Zarrintaj; Mohammad Reza Saeb; Thermally stable antibacterial wool fabrics surface-decorated by TiON and TiON/Cu thin films. Surface Innovations 2018, 6, 258-265, 10.1680/jsuin.18.00001. J. Kiwi and S. Rtimi. Environmentally mild self-cleaning processes on textile surfaces under daylight irradiation: Critical issues; Elsevier BV. : Amsterdam, 2016; pp. 35-54. Sami Rtimi; Rosendo Sanjines; Cesar Pulgarin; John Kiwi; Microstructure of Cu–Ag Uniform Nanoparticulate Films on Polyurethane 3D Catheters: Surface Properties. ACS Applied Materials & Interfaces 2015, 8, 56-63, 10.1021/acsami.5b09738. Henry J. Snaith; Pablo Docampo; Stefan Guldin; Ullrich Steiner; Charge Transport Limitations in Self-Assembled TiO 2 Photoanodes for Dye-Sensitized Solar Cells. The Journal of Physical Chemistry Letters 2013, 4, 698-703, 10.1021/jz400084n. S. Rtimi; S. Konstantinidis; N. Britun; M. Bensimon; I. Khmel; V. Nadtochenko; Extracellular bacterial inactivation proceeding without Cu-ion release: Drastic effects of the applied plasma energy on the performance of the Cu-polyester (PES) samples. Applied Catalysis B: Environmental 2018, 239, 245-253, 10.1016/j.apcatb.2018.08.024.